One thing that is most striking about Emancipation Park is its spacious design that allows for maximum freedom of movement. This is in keeping with the Park's theme of Emancipation. 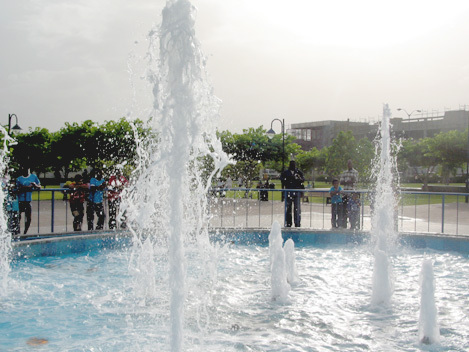 Since opening in 2002, the Park has not only become one of Kingston's premier landmarks, it has also developed into a preferred meeting spot for persons from all strata of society. It brings together visitors to the island and residents thus fostering an exchange of different cultures. This was what architect Kamau Kambui had in mind when he conceptualised the design of the Park. The Park's features he noted were designed so as to express movement and the celebration of freedom while maintaining a link to our African heritage. The ceremonial entrance at the corner of Oxford Road and Knutsford Boulevard where the Redemption Song statue stands is likened to that of a birth channel. While walking through the Park, one experiences the rebirth process being in tune with Mother Nature and all she has to offer. Water is a symbol of purity, rejuvenation and peace. 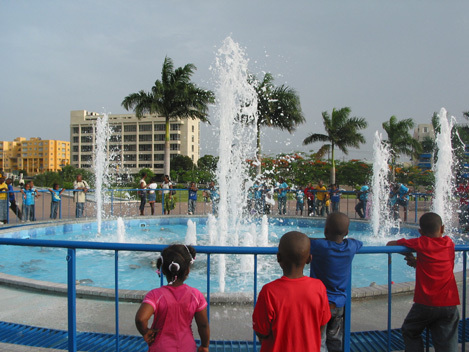 In keeping with these attributes, the water features form a major part of the Park's design. There are three water fountains located in the Park. 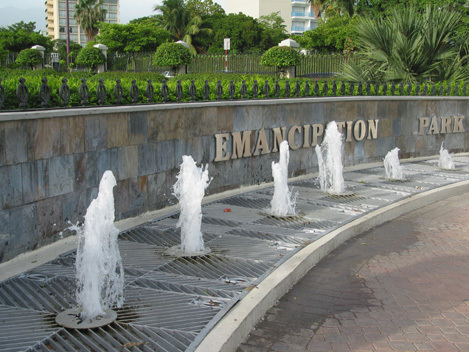 Each fountain represents a part of the journey of the Jamaican people, from the beginning of slavery in the late 17th Century, towards Emancipation in 1838. A water fountain in the form of an arc is located at the ceremonial entrance. It measures 1.5 metres wide with a circumference of 17.5 metres. It is a very simple fountain with water spouting from the metal grating at ground level. Passing through the gates of the ceremonial entrance are two reflecting pools lying on either side of the walkway. The calm water entices visitors to pause and reflect internally on their own personal journey. At the end of this walkway, is an eye-catching fountain that symbolises the womb in the whole rebirth process. This fountain is centrally located in the Park and has a radius of 10 metres. It is animated and can be programmed to music with several jets of water shooting more than five metres into the air through 24 nozzles using six pumps. It is a beautiful sight to behold especially at night as the water dances flirtatiously with the reflections from the fountain's coloured lights. The fountain has become a favourite backdrop for many wedding parties and other visitors to the Park for their keepsake photos. What is unique about this main water feature is that its operation is supported by an anemometer that automatically adjusts the fountain's water levels in response to wind speed, giving a perfect performance every time. On travelling the length and breadth of Jamaica, one is sure to see a few great houses and sugar silos comprised mainly of limestone that were built by the hands of slaves. Some of these structures date back as far as the 17th Century. As a mark of tribute to the craftsmanship of our forefathers, decorative limestone has been extensively incorporated on the walls of Emancipation Park including the restrooms, maintenance building and main office. Limestone is also used on the perimeter fence. Most of the stone for the Park (100 cubit metres of limestone) was sourced from Haddo, Westmoreland. The limestone was manually cut on site during the Park's construction and expertly laid and arranged by skilled masons. The kaleidoscope of colours that appear naturally on the walls and columns include blue, ivory and white, but whenever it rains, these colours transform to brighter hues. Approximately 60 per cent of the Park consists of landscape while the other 40 per cent is of hard surface that are paved with durable locally manufactured red bricks. The bricks are made from gravel and sand that were brought from St. Thomas. The paved walkways are accessible to persons who are physically challenged and allow for standard sized wheelchairs to be manoeuvred comfortably around the Park. 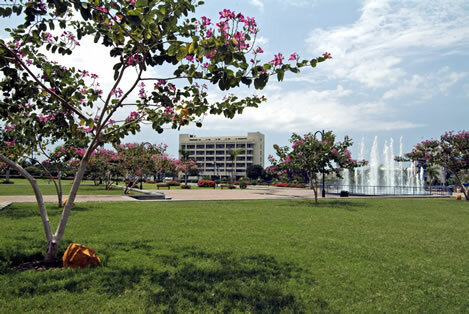 The gardens of Emancipation Park are the ideal place to have a family picnic or to have a heart-to-heart talk with that special someone. Your perfect spot could well be under a shady Poinciana tree adorned with its red flowers ablaze in the warm Jamaican sun or under a Poor Man's Orchid Tree enhanced with the sweet fragrance of its purple flowers. Which ever is your choice, the Park is a piece of tropical paradise for total enjoyment and relaxation for everyone. The landscape designed by Landscape Architect, Jenna Blackwood, incorporates several tropical trees and plants especially around the area surrounding the tiled multi-purpose stage. The Royal Palms around the stage area as well as along the main pedestrian walkway through the Park, linking New Kingston and Half Way Tree, were chosen for their stateliness. Other palms include the Bull Thatch Palm, Christmas Palm and Date Pygmy Palm. Most of the plants according to Blackwood were used for their hardiness, as well as their drought resistant and low-maintenance qualities.